Smart design and award-winning safety make the 2017 Nissan Maxima a sports sedan the whole family can enjoy, and the comfortable cabin will be the only place you'll ever want to spend your rush-hour commute. When you settle into the 2017 Nissan Maxima for the first time, the Zero Gravity front seats will take your breath away. NASA-inspired and designed to fit the contours of your body in the weightlessness of outer space, the Zero Gravity seats are all-in for best-in-class comfort. Your carpool buddies will appreciate the rear-seat legroom, which creates a rush-hour-friendly space for passengers of all sizes. Finishing touches, like ambient interior accent lighting and active noise cancellation, give the Maxima a true sense of luxury, adding to a quiet, stylish ride. The Maxima continues to accumulate all the latest tech gear, so you can take advantage of smartphone apps without looking away from the road. This year, Apple CarPlay is standard equipment for all Maximas. It simulcasts your iPhone apps onto the Maxima's central touchscreen, so you can make texts and calls in the safest possible way - without looking away from traffic. The NissanConnect infotainment system includes a crisp, 8-inch touchscreen with easy-to-understand menu options. There's also a redundant knob controller, which lets you interact with the system without jabbing at the touchscreen - a handy feature when you're cruising a busy highway. The Maxima offers plenty of ways to put your mind at ease. In government crash tests, the Maxima earned a perfect five-star rating for safety. The Insurance Institute for Highway Safety named the 2017 Nissan Maxima a Top Safety Pick+ - and for good reason. In addition to earning the IIHS's top score of "Good" in every test, the Maxima's forward collision warning system earned a rare "Superior." This technology automatically applies the brakes when it senses an oncoming collision, helping you reduce or even avoid damages. When you've been coasting on the highway late into the night, the driver drowsiness monitor lets you know if you're showing signs of fatigue. 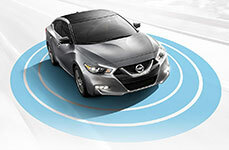 The NissanConnect telematics system was designed to provide the extra protection you need in a tough spot. For example, its automatic collision notification feature sends for help, even when you can respond. On top of everything, the 2017 Nissan Maxima is home to a powertrain that supplies luxury-level power and dynamic handling. The Maxima's continuously variable transmission is engineered to feel like an old-school, gear-shifting transmission, with distinctive shift points to appeal to speed-hungry driving enthusiasts. As you cruise around town and down the highway, the Maxima combines speed and sporty handling with impressive fuel economy, earning 21 city/30 highway mpg. The quiet sophistication of the 2017 Nissan Maxima Platinum will transform your life. Inside, premium diamond-quilted leather upholstery is a cut above luxurious, adding to the Platinum's air of exclusivity and generating the type of comfort that will make you take the long way home. In addition to premium comfort, the Platinum offers safe passage, because it comes loaded high-tech protective gear. The driver attention alert system, for example, monitors you for signs of inattention and warns you when you're showing signs of fatigue. 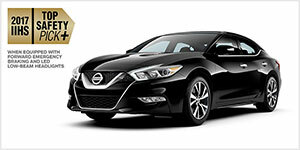 With a score of advanced driver aids, the Nissan Maxima does the worrying for you. Get an entirely new perspective on your surroundings. Quench your thirst for quality with quilted leather upholstery and haute color schemes. Get your smartphone fix without looking away from traffic. In your 2017 Nissan Maxima, every ride is a luxury. The cabin's leather-appointed seating and soft, supportive Zero Gravity seats combined with a powertrain that is pure sophistication gives you plenty of power for a sporty ride and the comfort to enjoy it.